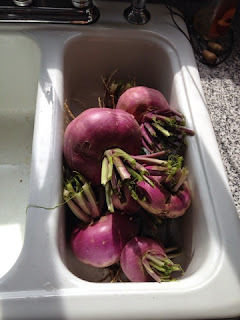 One of the new crops that I tried in my garden this year is the turnip. Why would anybody try turnips you are probably thinking. A lady I work with brought in a few last year and I was impressed with them. I also had a lot of luck storing root crops last year. Those two things were enough for me to grow some. I planted my turnips per the directions as soon as the soil was warm enough to work up. I live in Michigan so this was in April this year. I learned that this is not a great idea in Michigan though. The turnips grew well but they were not the size I wanted them to be before the weather heated up. Once the weather started heating up, the turnips started to go to seed. I learned from an old timer I know that this is not a good thing. Once the turnip goes to seed, they develop more of a radish taste. 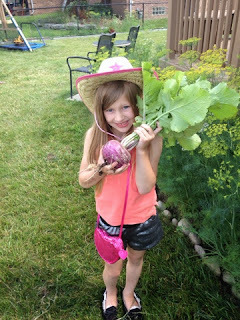 I believe turnips in Michigan should be planted in late summer for a fall harvest. Oh well, the turnips were a bit spicy but they were still edible. We used the turnips mixed with potatoes or stir fried. I even pickled some! It is now early August and I have another crop in for the fall. I plan to store the fall planted turnips over winter in my cold storage set up in my garage. One of my better turnips. Starting to make pickled turnips. 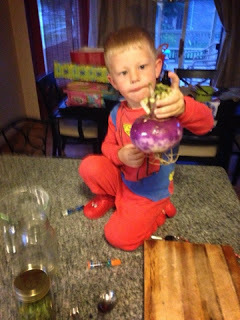 If you are looking for something new to try planting next year, try planting turnips. Turnips are now in my rotation. Not only do the roots taste good but the leaves can be steamed to make turnip greens. Now those are tasty!